Getting wedding dress cleaning and preservation for your wedding gown soon as possible after your wedding ensures that your bridal gown remains in the best condition. But, there are many bridal gown preservation options available, all claiming to be the best. It can be very confusing. This report is designed to help you make the best educated decision on the care of your wedding gown. 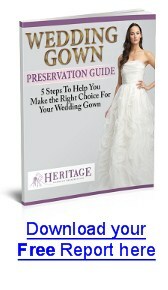 This report should only take about ten minutes to read and will cover why wedding gown cleaning and preservation is important, how museums preserve their heirloom dresses, the different cleaning solvents dry-cleaners use for wedding dress cleaning and the pros and cons of each one – which is safest and which you should avoid. Also discussed are the goals of wedding dress preservation, the different methods of preservation available and the benefits of each. So take a few minutes to learn before your decide who you should trust with your wedding gown care. Why Wedding Dress Preservation is Critical Learn why neglected wedding gowns run the risk of yellowing and developing brown oxidation spots. Determining the Best Wedding Dress Preservation To choose the best wedding dress preservation method, learn how museums preserve heirloom dresses. Learn about Heritage Garment Preservation – The Wedding Gown Preservation Company who provides TLC to your wedding gown. In a rush? Click here for summary! Click here for pdf print version.